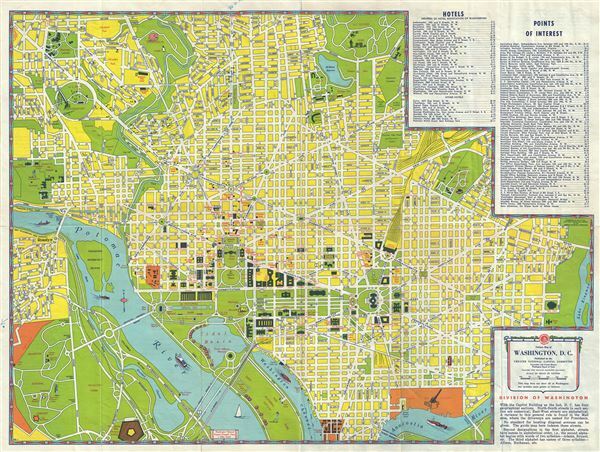 1951 American Automobile Association Pictorial Map or Plan of Washington D. C.
Visitors Map of Washington, D.C. This is a charming 1951 map or plan of Washington D.C. by the American Automobile Association. Published by the Greater National Capital Committee, Convention and Tourist Bureau and the Washington Board of Trade, the map covers Washington D.C. from the South Capitol Street bridge over the Anacostia River north to the U.S. Soldiers Home and Cleveland Park and from the Arlington Cemetery eastward as far as Lake Kingman. This beautiful pictorial map notes individual streets, important buildings, monuments, bridges, railways, rivers, parks and several other tourist attractions throughout. Several illustrations depicting monuments and other attractions adorn the map throughout, including boats in the river, soldiers, animals in the zoo, a canon, a baseball player, etc. The top right quadrant of the map lists hotels and points of interests noted throughout the map. Verso of the map features important tourist information, calendar of events, information about various monuments, etc. This map is copyrighted 1951 by the American Automobile Association and published by the Greater National Capital Committee, Convention and Tourist Bureau, Washington Board of Trade. Very good. Minor wear and verso repair along original fold lines. Minor manuscript markings at places. Library of Congress, Map Division, G3851.E635 1951 .A4.